In the online world, it's an eternity. 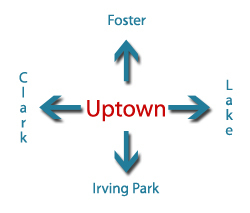 When Uptown Update began publication 10 years ago last month, Facebook was in its infancy. There was no Instagram or Twitter. The first generation iPhone hadn't been released. We can remember walking around Uptown with a "modern at the time" Sony digital camera to capture what was going on the neighborhood. Then we'd run home to plug the camera into an old laptop to save the photos. Now that can all be done instantly with a smartphone, with much higher quality photos. We were overjoyed to have 50,000 pageviews after a few months. Now it's approaching 12 million. Our very first post was entitled, "Wouldn't It Be Nice?" and featured vintage photos of the Gerber Building Red Line station. At the time, a total rehab of the station complete with the arched clock tower was merely a dream and in a never-ending design phase. It is happening now. There was no Target at Wilson Yard. We had just gotten our new Aldi, with the previous one waiting to be demolished across the street on Sunnyside, where the current Target now stands. The Riviera Building's hideous metal tan siding had just been removed and the rehab was underway. If you told us then, that 10 years later people would be living in modern apartments on the building's 2nd and 3rd floors, we would have told you you were off your rocker. Look at it now. The Uptown Broadway Building was undergoing its rehab as well. Horrible glass blocks were removed from the building's windows, the vaulted sidewalk was repaired, and the facade was brought back to life. If you told us a Vaudeville-style review with bar would be operating out of the basement as the Uptown Underground, we would not have believed you. If you told us we would have mid-rises coming to Broadway and Wilson and Sheridan and Wilson, we would have recommended having your head examined. No one knew what a transit-oriented development even was. The first time we printed the phrase was in 2014. Maryville Children's Academy had been empty for years, and the religious order that owned it was talking about putting the property up for sale. That's one story we didn't think we'd be following for most of the decade! There was one gift store back then: Unique Findings on Wilson. There were only a few bank branches. One Starbucks. We never thought we would see the day when Uptowners were worried about "too many" coffee shops, or "not another" bank branch! An Uptown 5K, Chicago's first shared street, art by the world-renowned Cecil Balmond, a restaurant that was named one of the best in the world... we couldn't have imagined such things in May 2007. Yet so many things that make Uptown, well, Uptown remain: Jake's Pup In The Ruff, where "only a rooster can get a better piece of chicken." The gorgeous retro lobby of the Bridgeview Bank Building. The Pancake House. Silver Seafood. The Bezazian Branch Library, given to Uptown by a war hero's father in memory of his son, who loved learning. National Car Wash, around for more than 60 years. The pioneering Black Ensemble Theater. Big Chicks, another pioneering business. The Green Mill, where you can still sit where Capone did. The beautiful theaters. The two friends who started the blog in May 2007 did so because they thought Uptown wasn't getting much attention in the mainstream media. We remember poring through Google looking for something, anything, about Uptown to post. Now things have changed so much that we sometimes get 50 new emails a day. 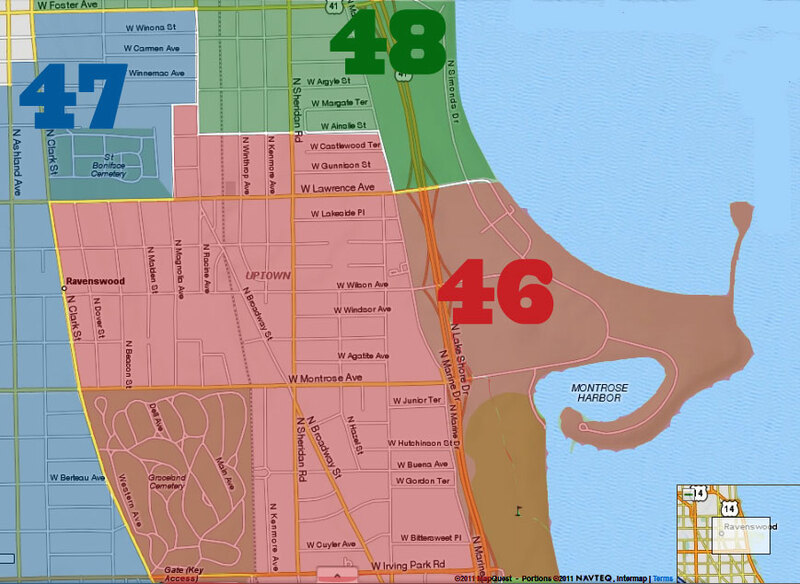 We remain proud and honored to have been ranked as the Number 1 Online Neighborhood News Site in Chicago by the Community Media Workshop in 2012. There has been a changing cast of bloggers behind the scenes over the past decade, but we all have one thing in common: a love for this community and the desire to see it thrive as a safe, healthy, diverse, exciting part of Chicago. Something former 48th Ward Ald. Mary Ann Smith said once really resonated: "Why not Uptown?" We couldn't do what we do without our readers and tipsters. Just as the roster of people who put together the blog has changed over the the years, the names of the commenters and readers have changed considerably too. But you're all passionate about "Community Area #3," as Uptown is known. You are our eyes and ears for the good, the bad, the ugly, and the changing landscape that comprises our community. Without your photos, tips, observations, and comments, we wouldn't exist. It's been a fun decade. We can't wait to see what happens next. P.S. Maybe the Uptown Theater being reopened can be the lead story in our next retrospective article? Please?! Thank you for all your hard work over the last decade. When I first moved to Uptown in 2010 for a job, your site was the first check-in everyday. Here's to another decade of growth and excellent reporting. Cheers to you Uptown Update! Ten years. Lotsa good things have happened in that time. My personal favorite was Shiller announcing she wasn't running again in 2011. This blog had a whole lot to do with that. Snicker. I need a metaphor for Uptown over the decades. The Tao of Caddyshack comes to mind. Think of Uptown as the gopher. No I don't mean small, furry and rodentlike. I mean surviving, thriving and dancing. Perhaps a mocking dance to the doubters who didn't believe and the "obstructors" who thought they could hold onto their vision of an Uptown where life was nasty, brutish and short. Congrats UU. I'm looking forward to the next 10 years. I love this neighborhood. Moved here about three years ago, renting for now, and will definitely try to buy a place soon. This blog was so helpful in informing me about the neighborhood as I was relocating here from out of town, and continues to keep me in the loop. Here's to a great neighborhood, and to all your good work in documenting/updating/promoting! Congrats UU! Thank You! Here's to many more years!